I am working down the list of things I have to do before I head off to Heather Quilters for tonight's talk but I just had to quickly catch up with everyone here. Newark were great, as expected. Speakers, you really want to go to these groups, they are friendly helpful and well organized, well worth a visit. Just plan to stay a couple of days if you can as there is plenty to see and do in the area. Thank you very much to my team of helpers, you did a stirling job last night and meant I got home a lot quicker than I had expected, I was back before 1.30 am ! I also avoided doing any more damage to my back a shoulders with is very much appreciated. I didn't manage to try one of the famous black bananas though, so I will have to make a return visit. I did however explain 'shaking the lettuce' and remind a cat how to play, so I feel it was a good value trip. I just wish I had taken some in progress pictures of the leaf quilt. Oh well maybe they will email me some later. My main reason for posting is I have just found out there are a couple of places left on my class tomorrow. 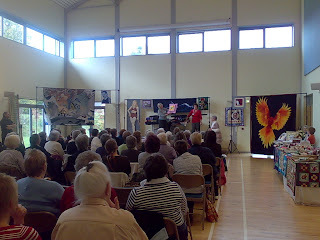 It is the Autumn Leaves class that I was just teaching in Newark and is based on my award winning quilt, 'Golden Storm'. It is being run at the Wandering Line in Purley. This is a new shop that opened about a month ago but it sounds like it is attracting a lot of new people into quilting, which has to be good news for all of us. If you are at a loose end tomorrow and would like to join the class, give them a call on 020 8660 8600. Now I had better get back to my task list for tonight. Loonking forward to finally meeting Heather Quilters. I don't feel like I am getting chance to catch breath at the moment, and mostly it's pretty cool. Over the weekend I was at the MCM expo. It is a movies, comics and manga show, and if you've never been you really cant imagine it. 40,000 people over two days in a hall that really isn't big enough to house them. I could call it organised chaos but to be honest I'm not sure how organized the chaos is. I was there with my Bad Rain quilt which was very well received. I was surprised by who was most interested in it. It wasn't the older ladies, it was the young Indian males. They were very positive and fascinated by how it was put together. It was lovely to be able to bring quilting to a new and enthusiastic group. I was less than impressed with the Excel center itself and it's staff. There were times when it felt they were trying to make things as difficult as possible fro everyone involved with the event, including the organizers. As one of the traders I had to go back and forth to the car during the day and it is very frustrating when routes suddenly get closed off without warning, or indeed discussion with the organizers. I am very glad there wasn't a need to evacuate the venue, as I think it would have been hard to do. There would have been too many people trying to get out of exits that had been there at one point but were now closed off. I hope the venue will listen to the organizers and sort out these issues before the next MCM. Today I am trying to get some quilting done while I wait for my car to have it's gearbox oil changed. It's a job that sounds trivial but is actually quite a pain unless you have the right suction tools. So I decided I would get on with what I do best and let someone else deal with the oil. As soon as the car is back I will be heading north to Newark. This is fairly close to a talk a did a little over a month ago and I am looking forward to going back. The people were so friendly there and it's a lovely place. This however will be a pretty quick trip. I will drive up tonight then teach a workshop tomorrow. After the workshop we will change venue and I will do a talk then head home. It will be mad, but fun. I may also get to try a black but barley ripe banana. Wednesday is another talk, hopefully after some more quilting. This time I will be at Heather Quilters in Camberley, Surrey. I'm looking forward to this talk as well. It was one that should have happened a year ago, but due to a booking error I never got there. Hopefully I can make it worth the wait. Anyway, quilting calls so TTFN. Do you design in the shower? I design a lot in the bath, and I know I was recently talking to a lady who designs in the shower. I suggested that children's bath crayons might be useful for taking notes, but I've found a better solution, so if you are that lady (or indeed anyone else who does this and is interested) get in touch and I will pass on the information I have. There is a little something I would like to send to the shower lady so if you know who I am talking about please do let her know I am trying to get in touch. 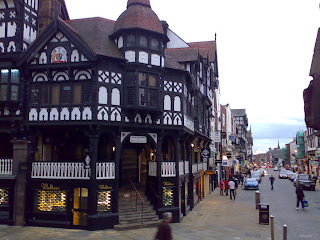 This was Saturdays talk venue. It's not often that I get the space to hang this many quilts or the chance to take photos, so I made the most of show and tell. It was another scary talk with not only celebrities in the audience, but one of the two best speakers I heard. Intimidating and rather off putting. However it was also great opportunity to talk to lots of new people. I also came home with a couple of new patterns, one for cats and one for elephants. I am even more sure that I won't be making a baltimore quilt. I really like them done by hand and not by machine. I can't see having the time to do it, or find a way that doesn't hurt my shoulder. I've mostly been working on customer quilts, but I have also been shipping patterns today. The rest of the Turning Twenty patterns have now arrived so I believe that all orders have now shipped. I can't promise when they will arrive, given there is a postal strike due. I hope they will arrive before the strike, but who knows. Does anyone remember this quilt? I bet those that do thought I had forgotten to post the picture of the finished top and possibly the finished quilt but no. I just haven't had a lot of time to work on it. In fact the only time I have had is the odd few minutes waiting for classes, so that's when I've been working on it. The top is from a kit by Starr designs. It was intended to make a twin size quilt. I don't have a use for a quilt that small so I had to figure out a way to make it bigger. In the kit there was a red fabric for the areas I made black. I knew I couldn't match it and that it was the obvious fabric to use to extend the quilt so I changed it for one I had a lot of. The black is a batik not a true solid which I thought would be more sympathetic to the dand dyes. The internal strips are wider than the original and the outer borders are much bigger. I was able to get the narrow rainbow border out of the offcuts from the blocks, which broke up the outer border nicely. Had I not been able to do that I would have used the supplies red fabric to do the same job, as a border big enough to get the quilt the size I needed would have been out of proportion to the rest of the quilt. I suspect I won't have time to quilt it until Christmas, I've got too much customer work to do. When I do get to work on it I have lots of Aurifil thread to play with on it. I thought it would be good to have a really nicely quilted quilt for my bed for a change. When it's done I might bind it with the red fabric, or use the red for piping. I'll just have to wait and see what feels right. The first batch of Turning Twenty patterns have arrived, and all the orders for book 2 have been shipped today. The other books haven't arrived yet so won't go out until next week. Unless they arrive tomorrow they will go out after the postal strike, so hopefully they won't get caught up in the backlog. Assuming of course the strike is still planned, I can't find anything about it. I also now have a few copies of the new Turning Twenty pattern. It is called Slapplique, and will be on the site as soon as we can get it on. If you want to order it before then just drop me an email. 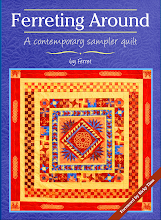 I've also just finished writing up not one but two journal quilts. I had a lot of fun with them and I may well make a series of them based on these two. Of course that does rely on me getting a few more hours in a day. Finally if you are near Lavenham in Suffolk this weekend you might like to come along to the Quilters Guild region 8 event. It is being held at Lavenham village hall, and if you need more information about it, get in touch with me and I will either be able to answer your questions or give you contact details fro someone who can. Finally time to share my pictures from the weekend. 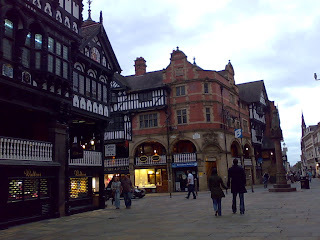 Frodsham is near Chester which is where the pictures are from. I have to admit it wasn't a place I was familiar with, but now I am I want to go back and have a better poke around. It is a Roman walled city, with am amazing amount of wall left. 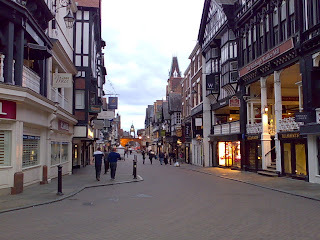 It also has these fantastic shopping streets, with two shopping levels. I had a chance to see some of the under crofts below the shops, but as they are now businesses in their own rights I couldn't get pictures of them. We also had time to walk about a quarter of the city wall and see the remains of the amphitheater. The amphitheater must have been very impressive, to say nothing of imposing. You can only see a section of it, but the angle of the curve makes it very clear how huge it was. I'd like to go back to the area to go up the hill between the two places. Apparently (and I can well believe it) there is a great view from the top. Sadly this trip I had to head back straight after the workshop, but now I know how lovely the area is I know to try and extend the next trip. I felt the workshop went very well on the Sunday. We were working on 'Fur, feather and scale' and everyone left with three good samples and seemed pretty confident they could continue with the techniques in other projects. I hope they will share what they come up with as some sounded really interesting. However I think the big success of the day for me was getting another person hooked on free motion quilting, it might not have been the main point of the class but it's always good when someone else finds they can do something they didn't think they could. Thank you all for making it a great weekend. See you at the AGM in March. Sara Impey, who would have thunk it? Today's talk was for region 13 in Cheshire. It's far enough that I didn't think it was sensible to go there and back in a day which is unusual for me, so we drove up last night. I say we, as Tet came along to help, he had said it might be a big talk. Understatement, they are very keen around here. It was an amazing show and tell and a very scary audience. I had no idea they had so many well known names here. Probably just as well or I would have been worrying about it before the talk. At least I had a professional chicken stacker to look after me and to make sure I was in the right place at the right time. It seems herding Ferrets requires the same skills so I was very well looked after. Fortunately my talk went down well, as with a crowd of that size you really don't want to upset them. Many hands made quick work of packing my quilts and ensured I got lunch before the afternoon session started. Thank you very much to the lovely lady who gave Tet a lift to the station ns saved me getting lost or missing the afternoon talk. I have to admit I wasn't sure how I was going to get along with the afternoon speaker, but I do like to hear as many talks as I can so I was pleased to be able to stay. If you aren't familiar with Sara Impeys work I guess you either aren't a quilter ror have the same problem with names I do, her work appears all the best places, and I think she said she will have a piece in the V&A quilt show next year. Her work generally includes words and circles. She described herself as "a one trick pony" and when she said it I agreed. I loved her work the first time I saw it, and had thouigh all the others were too similar. Boy how wrong was I? I just hadn't got it at all. To really appreciate her work I think you need to see more than one piece at the same time. The year long gaps I have had doesn't do them justice at all. About half way through the talk it struck me, she is a writer who carves her words in textiles. The words are very important. Her quilting, while beautiful and exceptionally well executed, isn't as significant. The thought and feeling that goes into the letters surprised me. I think what really amazed me was that I hadn't worked it out for myself. After all if someone puts that much care and attention into each letter, might not the words they form be important? I hope at some point one of the shows will give her the space to display a lot of her work at once, and that she will write the background stories down to go with them. It would make a stunning show. Sara, a one trick pony? No more so than a writer who only writes in one language. A very entertaining and informative speaker. I believe she doesn't do many talks but if you get the chance to see her take it. I thought today was going to be a fairly restful day. I had a few things I needed to do, but not too much. One job, that doesn't sound bad on paper is post a book. Just within the UK nothing complex. However the post office has had massive queues that last few times I have been there and I didn't have a spare hour to queue. I thought I would take another look at online services. Oh dear. That was my first mistake, calling Royal Mail to try and fix it was my second. Their phone line is an adventure game, but lacking any plot, none the options seem to fit what I needed at all, but it kept suggesting the online help. OK while I try and struggle through to a human I will ask the online person. Sarah, isn't actually a person, it's a pretty poor piece of software that tries to guess the question you were asking. Sarah felt that what I wanted was to get a job with them. Nope, not even close and no there isn't even any way to tell the software it missed. I did eventually get a very nice lady in customer services, who absolutely understood my problems, and did try to help. She assured me that Royal Mail does want to help small businesses and that I can't be too small to be worth their help. She gave me a phone number she thought was a direct line to business accounts. It wasn't it was online postage sales, who couldn't help but could pass me on. To online business accounts, who can only talk to you if you have an account but can pass you on to sales. After all this run around, I'm too small. I need to go to the post office. So including time, parking, postage and petrol I can spend about 35 pounds to post this book. Or I can call a courier and spend about 10 pounds, or I could just hand deliver it as I happen to be doing a talk in the area and it looks like it will only be a few miles out of my way. Isn't it great to know you can get a package anywhere in the country, just by taking it there yourself. We are heading backwards at truly amazing speed. I think the next time I queue at the post office I need to buy a heck of a lot of stamps then I can just stick the postage on and put it in a post box. They do still sell stamps don't they? Well most of the guilty party at least. I think we have to share the blame with Melanie Cook the colourist as well. From Left to right, we have Stephen Downey, the artist, me, and Cy Dethan the writer of Cancertown. 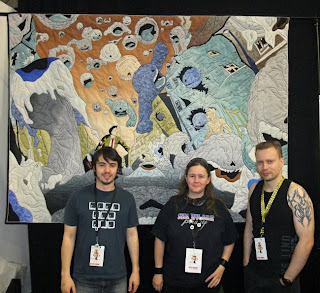 It was odd seeing my quilt hanging in a comics show, but very cool. Somewhat scary having 'real' artist looking at it, but I guess I will get used to that. 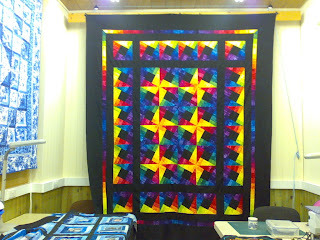 I was pleased that the visitors to the show appreciated the quilt. I was a little concerned that it might be too far from their chosen media, but apparently not. They are a generally friendly bunch ready to accept the weird especially when it's from a story they have enjoyed. I also got to pick up a copy of Bryan Talbots latest, Grandville. Oh wow, does he know how to produce a book. It's a proper old feeling hardback with a fabric texture cover. Apparently the issues in other countries are even nicer!? I think my copy is pretty wonderful, and yes the fact that he signed it and put in a sketch doesn't hurt at all. I can't wait to have a chance to read it. I will take it with me this weekend in case I get an early night. I also came across Stephanie Bryant. Well actually I mostly directed people to her, as they saw the quilt and assumed I would know of her. They mentioned knitting and I had noticed that much about her stand so I was able to direct them. Sunday afternoon Nic asked if I had seen them, yes....what did I think of the concept? Um? Turns out Stephanie has produced a comic for knitters. Each part of the story comes with a pattern, how cool is that. The patterns are good too. She also had a few stand alone patterns, which may yet follow me home. If you would like to see her wares in the flesh (yarn?) 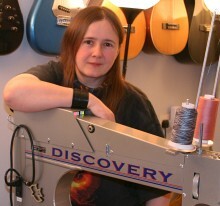 she will be at the Knitting and Stitching show that starts tomorrow and runs until Sunday. It is at Alexandra Palace, London. If you're there on Friday I might see you around. If you can't make it, do take a look at Handknit Heros, it's great. I was going to post about the comics event this weekend. I didn't have time yesterday and now I have been well a truly beaten to it. I may share the photo later anyway, when it returns home, but for now take a look at Cy's blog and vist the show with him. There are a couple of places left on my Machine Quilting 2 class at Patchwork Corner this coming Tuesday. In this class we will spend the whole day on free motion quilting. Starting with some warm up exercises I will show you lots of different patterns during the morning. Fillers, borders and anything else that seems to suit the specific students. In the afternoon once everyone is limbered up and the machines should have got the idea of what we are doing we will go on to feathers. Lots of different variations so hopefully everyone will find at least one that works for them. It's usually a fun class, and it will count as your exercise for the day. If you would like to join the class contact Patchwork Corner. You can even sign up on line. I've mentioned socks a few times and I finally remembered to photograph them. 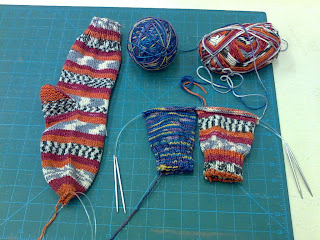 To the left is my first sock knitted on two circular needles instead of on 4 double ended ones. I love the techniqe. It's a lot quicker and I find it easier on my hands too. It's just waiting for it's toe graft, then it's done. it's partner is being knitted with the first sock of another pair. Two socks at the same time on a pair of circular needles. I'm not sure how it compares speed wise with knitting one at a time, but it is very satisfying. It also encourages you to keep making more if you've already done one sock of the next pair. Of course you could knit matching socks together, but that means splitting a ball of wool and increases the chance of mixing them up and knittinmg with the wrong one. I think I will stick to doing odd socks.